The 2013 calendar for the Electric Picture House in Wotton-under-Edge has now gone on sale. This is the second calendar which has been produced as a result of a photographic competition to obtain twelve stunning pictures in and around the locality. Previously pictures for the cinema’s calendars have been supplied by a handful of very keen supporters of the cinema. But last year the task of supplying suitable and photogenic shots of Wotton was opened up to local enthusiasts in the form of a photographic competition which proved to be so successful that the decision was made to repeat it again this year. The calendar is available from the following locations within Wotton: the cinema, One Stop Shop, Thomas’s clothing and footwear shop, the Wotton Farm Shop, Daisy M Vintage gift shop, the Market Place financial advisers and the Bear Street Garage. 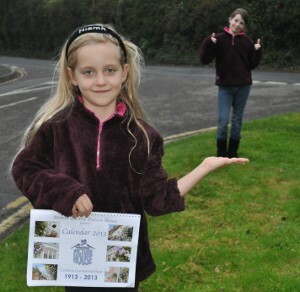 Picture caption: The youngest of the contributors to the calendar, eight year old Niamh Keane from Wotton, shows off the first copy with her sister Ellie. They are striking a pose similar to that in the picture which won Niamh’s place.